I’ve tried water-based sealers before, but they are no good. How are WBS products different? A: Traditional acrylic water-based sealing products are based on a latex chemistry and they suffer from several shortfalls. However, the WBS range of sealers are created using new technology and are specifically designed to overcome all the shortfalls of the older generation of water-based products..
I’ve heard that penetrating sealers aren’t that good for stains? A: Most penetrating sealers on the market and silanes and/or siloxanes. These are only water repellers. They will not stop oils, stains and ground in dirt. The WBS products are different. They form a physical barrier, like film forming sealers, but because the polymers are nano-sized they penetrate below the surface and form a matrix seal from the inside out. Once cured this matrix seal stops stains from penetrating right down at the molecular level. 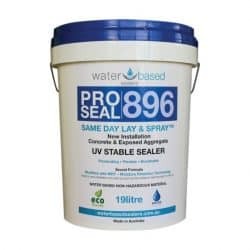 The ProtectGuard Range are full penetrating sealers that act similarly to silanes and siloxanes but they are made from specialty fluorinated polymers which repel not only water, but also oils and stains. They do not form a physical barrier and therefore are good options where the natural grip levels of the surface need to be preserved. A: Firstly, Water Based Sealers products are premium quality products that have a number of advantages in terms of performance and usability. Second, all the products are sold as concentrates that are diluted with water prior to application. 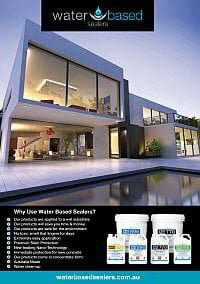 As such a container of WBS sealer will typically go about 5 times further than the same amount of a competitor’s product. Therefore, when considering the total cost including materials, application costs and life cycle, the Pro Seal range is actually a very economical sealing option. Why are the Pro Seal products sold as a concentrate? A: By selling the product as a concentrate we can minimise cost and environmental impact. There is less packaging, less freight cost, and lower freight-related emissions. The products can then be easily diluted with the water source at the point of use. Does Pro Seal give a “wet look”? A: Using Pro Seal 770 as a primer prior to application of Pro Seal 896 with give a subtle colour enhancement without making it look fake, this colour enhancement is permanent. Almost all the ‘wet look’ sealers on the market will not hold that depth of colour for long. Initially they significantly darken the surface but after a week the colour depth will be about half of what it was when wet. After about 3 months or so there will be no discernible difference between a ‘wet look’ sealed surface and a Pro Seal surface. For a full wet out type colour enhancement use ProtectGuard Wet Finish Premium. 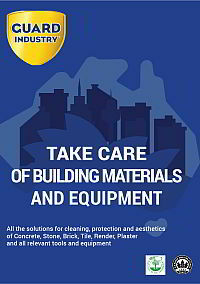 What is the durability of Wet Look Sealers? A: The colour enhancement provided by most solvent acrylics is somewhat temporary. The colour developed at the time of application is similar to a wet surface, however, this will sufficiently lighten as the sealer cures and will continue to fade over the next 6 months or so. After six months in the sun a solvent wet look will not be noticeably darker than a water-based seal. Further, solvent based acrylics generally go yellow with exposure to UV. 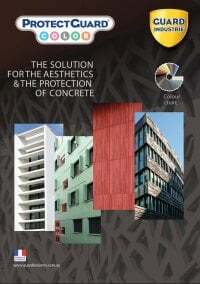 ProtectGuard Wet Finish Premium gives a proper wet out colour enhancement that lasts. Since it is a full penetrating product it cannot flake or pell and won’t make the surface slippery. 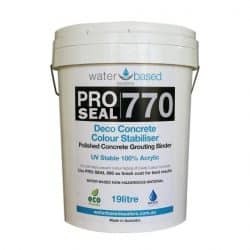 Using Pro Seal 770 to subtly enhance and stabilise the colour will not make the surface initially as dark as a wet look solvent, but it is a permanent enhancement that will not yellow. Acrylic sealers – are they water based or oil/solvent based? A: Many people assume acrylic sealers are only oil/solvent based, however, acrylic sealers are available in either an oil or a water base. 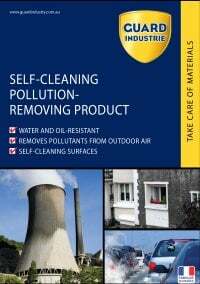 What’s the difference between oil/solvent based and water-based products? A: There are many different types of products in each category and each vary significantly in their appearance and properties. WBS products are founded on advanced chemistry that makes them superior in almost every way to existing water-based products. The general differences that apply between WBS products and oil/solvent-based film formers are found here. What is a breathable sealer? A: A breathable seal enables moisture trapped in the substrate to pass through so the substrate can dry out. This is particularly important in area’s that are often wet/damp, such as pool areas, sunken outdoor areas, pavement next to raised garden beds, etc. Solvent film formers trap this moisture in. Leading issues such as discolouration, delamination and eventual failure of the seal. If a seal is breathable and moisture can get through, won’t stains get through too? A: Water molecules are much smaller than the molecules that make up most common stains. Pro Seal 896 and Pro Seal 898 have been designed to leverage this difference. The tightness of the developed matrix is such that water molecules can work their way through, but other water-soluble stains can’t. All solvent based stains are repelled as they are polar in nature and are physically incompatible with the pores in the matrix structure. 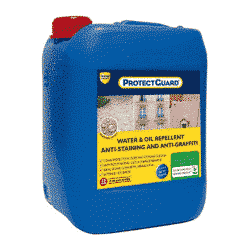 The Guard Industry products work by actively repelling a broad range of contaminants. While allowing substrate moisture to be released as vapour. What is the life of the sealer? A: The WBS products penetrate below the surface to form a matrix within the substrate. This matrix strengthens and stabilises the surface and the surface of the material sealed protects the sealer from wear and tear. As a result, this matrix will remain intact for the life of the pavement. We normally assign this service life to be 25 years, but, this will vary depending on the type of materials sealed, how much traffic the surface receives and what forces the surfaces is exposed to. The portion of the matrix that extends above the surface is UV stable and very durable, but it will wear away like any other wear surface. A single coat of Pro Seal should be reapplied every 3-5 years to rebuild that wear layer and protect the underlying substrate/polymer matrix. Most of the Guard Industry products come with a 10 year insurance backed guarantee.